It was 2017. October. Harrison County, Mississippi. Mom Chelsea Nobel woke up in the middle of the night with that horrible feeling that something wasn’t quite right. Chelsea looked over the other side of the room to where William, her 2-year-old son, should have been fast asleep. But William wasn’t there. He was gone. Chelsea leapt out of bed and desperately ran around the house, searching for William. But there was no sign of him. He had simply disappeared. So Chelsea called the police. The police immediately began a comprehensive search for William in and around the Mississippi community where he and his mom lived. Police helicopters and dog units were dispatched to help search the heavily wooded area. Scores of volunteers from the local community also helped with the search. But there was no sign of William anywhere. And then a clue to the disappearance. A set of tiny footprints was spotted in woods close to the family home. As the authorities followed the footprints, a second set of prints was always close by. But the second set of prints did not belong to a human. 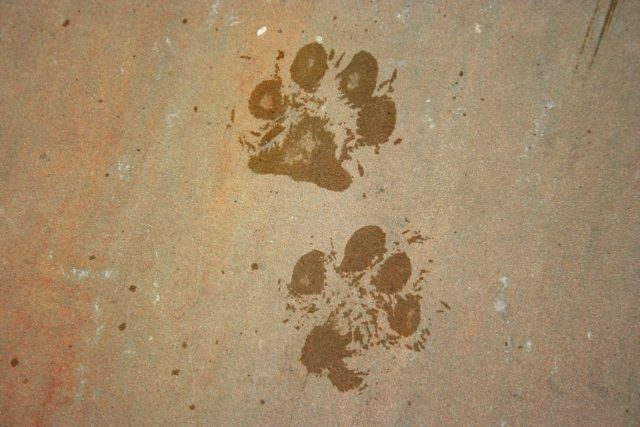 They were unmistakably paw prints. So whoever the footprints belonged to, it appeared that they were not travelling alone. Little William Is Found Alive And Well! Several hours after Chelsea had reported 2-year-old William’s disappearance to the police, 10-year-old Blake Carroll arrived back home from school. Blake’s uncle’s old truck was parked up outside his house and strangely, the horn was beeping from inside the vehicle. So Blake went to investigate. A dog was circling the truck, appearing to want to get inside the vehicle. As Blake approached his uncle’s truck, the dog began barking loudly. Blake looked in through the front passenger window and was astonished to see a little boy, crying and beeping the horn. Although he didn’t know it at the time, Blake had found little William, alive and well. Blake went inside the house to get his uncle, who came out and opened up the old truck. Upon discovering William, Blake’s uncle called the authorities, who quickly arrived on the scene. At that point, the search was called off. Luckily, apart from a few scratches and bug bites, little William was unharmed. Chelsea told the authorities that William was undergoing tests for autism at the time of his disappearance and he was mainly non-verbal. Consequently, he may not have responded when searchers nearby called out his name. Upon being reunited with her son, Chelsea broke down in tears. However, the authorities subsequently charged Chelsea with child neglect, as it was determined that she had not been properly supervising William at the time of his disappearance. The dog, named Jezebel, was hailed as a heroine by the Harrison County Sheriff’s Department. It appeared that Jezebel had somehow found William wandering in the woods and had then stayed with him throughout the night.